The 2019 Be a pART of it! T-shirts have arrived! Your purchase helps to fund an Arts scholarship for a graduating Northville High School senior and as well as community-focused children’s art programs! For more information scroll to the bottom of the page or contact the Northville Art House at 248-344-0497. Order yours today while supplies last and Be a pART of it! Thank you for your support!! Please find your t-shirt size(s), indicate the quantity, shipping options, complete the form and make your secure payment. Ship to Address: Shipping is available online for up to 2 shirts to residences and businesses in the Continental U.S. only. Orders will arrive in 5 – 7 business days. Pick-up: Orders for pick-up are available the next day during regular hours: Tue – Fri 12 – 5pm & Sat 12 – 4pm. Orders made Saturday – Monday will be ready on Tuesday. Special orders: Online orders for quantities more than 2 will be held at the Northville Art House for pick up or may ne special ordered by phone for shipping. Please call the Northville Art House at 248-344-0497 for special orders and questions. Limited supplies in stock. Order yours today. Thank you for your support! Yes, I would like to receive the Northville Art House monthly e-newsletter. The scholarship goes to a Northville High School graduate who plans on obtaining an art degree at a college or university. The criteria and selection is determined by a committee and presented during the honors assembly at the high school in May. A formal application is required and is available at the high school. 100% of the t-shirt proceeds goes toward the NHS scholarship fund until the maximum of $650 is reached. Afterwards the proceeds go toward children arts education programs. 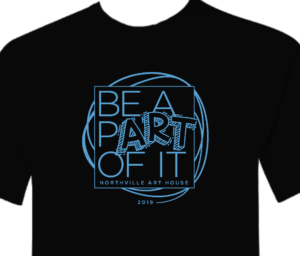 Charitable contributions to the Northville Art House, a government unit, are tax-deductible under section 170(c)(1) of the Internal Revenue Code, if made for public purposes. Please consult with your tax advisor or the IRS to determine whether your purchase qualifies as a charitable deduction for federal income tax purposes.